Ron Mastro got the call at 7:00pm on Saturday night telling him to be in Greenwich by six Sunday morning. 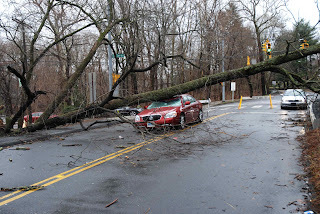 The worst of the March 13th Nor'easter hadn’t hit coastal Connecticut yet, but Mastro a Connecticut Power storm damage assessor from Waterbury understood; the heavy rains and massive winds would leave a path of destruction. Indeed that was the case. 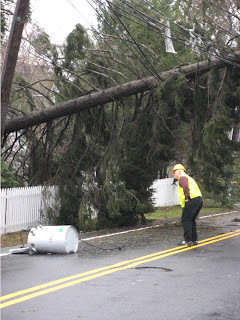 Shortly after eight, a tree fell on a resident of back country Greenwich, killing her and injuring her companion. Emergency workers were delayed in their attempts to reach her because of blocked roads, according to an interview with the police chief David Ridberg in the local paper. "All the access areas were blocked, the officers and EMS had to walk to the scene and it took a while to get there." 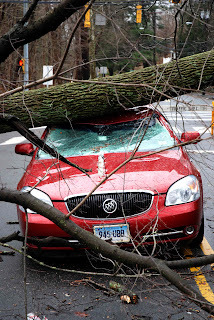 By dawn Sunday, Greenwich town leaders declared a state of emergency. Hundreds of trees uprooted in the storm ripped down power lines, smashed through homes and garages and blocked roads. 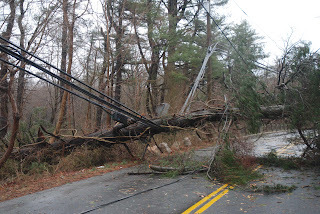 Eighteen thousand people are without power in Greenwich, about the same number in Stamford. Storm sewers backed up causing flooding in the streets and in some homes, too. 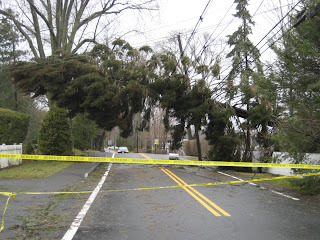 The most dramatic damage I saw on my side of town, Old Greenwich, was the towering hemlock that fell across Tomac Road near Innis Arden Golf Course. 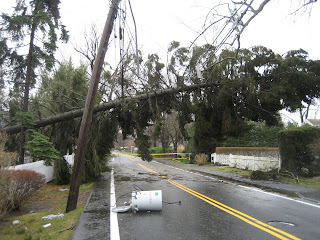 As it fell, it sent a cylindrical transformer the size of a beer keg, crashing off the top of a power pole and onto the street. Assessing the damage, around 2:00 this afternoon, Mastro said it would take days to clean up this particular mess. Last night Sabah and I were returning home from shopping at about 3:30 - driving north on Westover Rd. 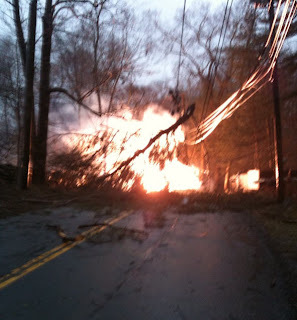 We encountered a power line draping across the road. It was black and nearly invisible. I decided to stay and direct traffic around it because it was very dangerous to southbound cars - they wouldn't see it and if they hit it, it could come right through the windshield with catastrophic results. I directed traffic for about an hour and waited for the police - 4 calls to 911 and no police ever showed up. Sabah finally called Khaled at home and asked him to bring me a warmer jacket, gloves, hat and flashlight. Khaled arrived just as the powerline came down. He heard the blast and saw it explode in his rear-view mirror. He was the last car that came though there. Five seconds later and he would have been a part of that - very scary. 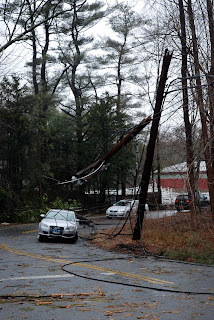 Chuck, who lives in north Stamford is without power and was gracious enough to plug into a generator to download and share with me, these other photos, taken yesterday in Stamford. utility workers brought in from around the state will remain in Fairfield County, spending their work all their waking hours repairing the damage from this weekend's storm. Read the statement from Connecticut Governor Jodi Rell.